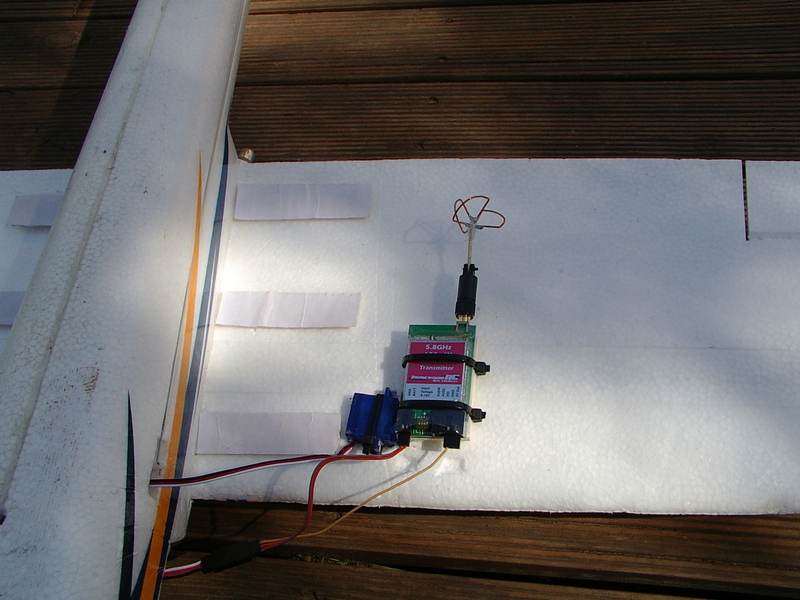 I'm having a writers' block type thing with my Bixler and 5.8Ghz vtx... The last two sessions, I haven't been happy with the placement. First I had it behind the camera, where I used to have my 900Mhz vtx, but the antenna doesn't get enough height. The antenna wasn't near high enough and video was less than perfect. Next I moved it up in front of the motor. It was great at lower altitude, but get up higher and when on the way home, video was getting way too much shadow from the plane. What's the best spot for it? 5.8 GHz video transmitters are hard to place because it does not penetrate EPO really good. Below the wing is indeed the best place but I dont think it's really that easy. 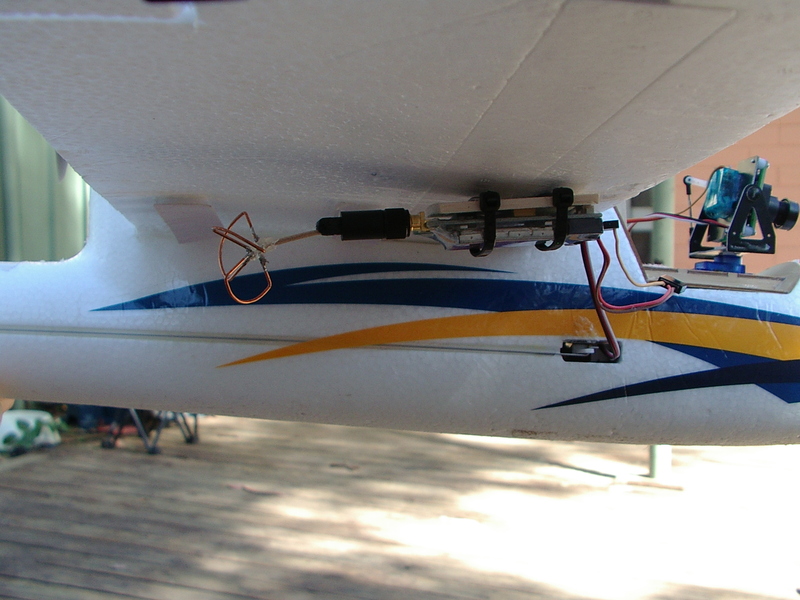 Also it does not matter if your antenna is upside down if you are going to mount it below the wing.. I was looking at the vertical stab, and the wing tip, then below the base of the wing, then further out on the wing. I guess ideally it'd retract out the bottom of the fuselage, but if the mechanism failed I'd be in all sorts of trouble! thats a good question !! where is the best place for it ? are you using clover leaf and skew plannar ? does antenna extensions for the clover leaf affect the signal ?? I'm using a cl on the vtx. I've also only got a short antenna, because I made it out of the stock one. I've made up a little mechanism with a servo and some balsa. 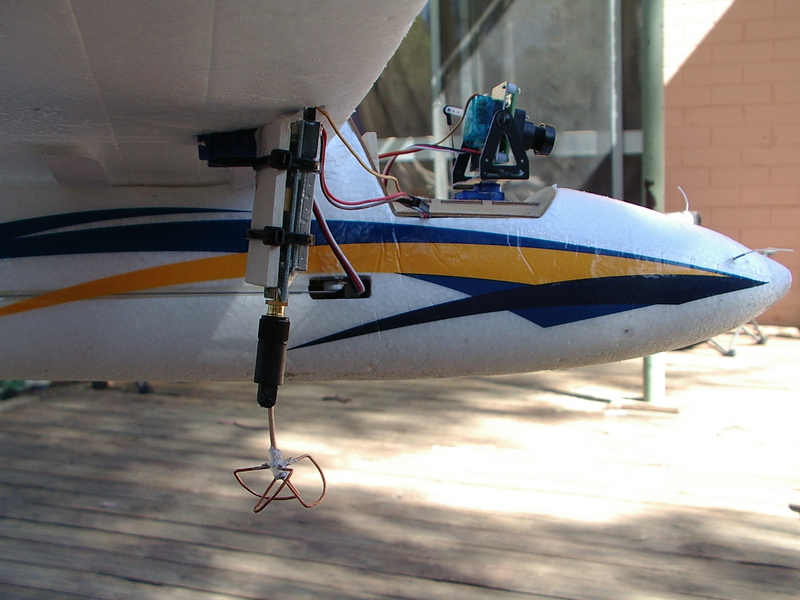 The vtx sits on a balsa plate and is lowered/raised on the gear switch. It seems strong enough on the table (and shaking the plane in my hands), but some field testing is needed on this. I've placed the vtx about 10cm out from the fuselage under the wing and the antenna just protrudes past the bottom of the fuselage when lowered. Reminds me of... a spoiler. When I flew full size gliders we used those to decrease lift. Yeah, it'll create some drag. I should have shown front on too. It doesn't take up much more area than landing gear would. I'm going to see how it flies and make modifications as needed. As I said, Mark I. Mark II will be parallel to the wing I think. I didn't expect the servo to move as far as it did, so I straightened the antenna a bit. I thought the tx would sit at a 50 degree angle or so and not kill so much airflow. While I was playing with the Bix, I also removed the velcro holding the wings together and put rare earth magnets where the ends join. They didn't quite meet, so I put another magnet in between them and it's now a pretty solid connection. It'll be nice having the inner part of the wing for lift again. Very creative lobster! 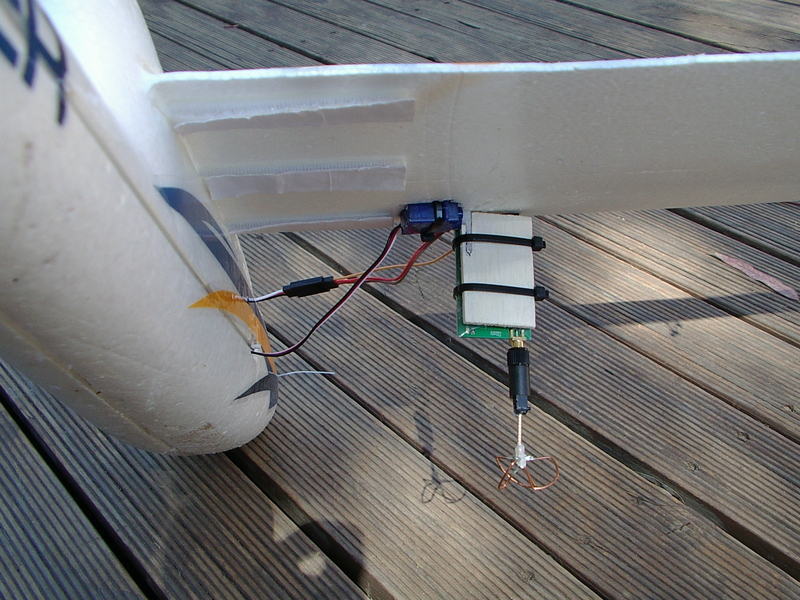 When speaking with IBcrazy he said that it is ideal to put the vtx out on the wing, not on the fuselage, if you are planning on flying further away. If you are staying low and fast like he does it is ok to fly with it on the body. Great work, I can't wait to see how she flies! Thanks Ben. I pretty much just ran with Andre's suggestion and it really was that easy! Three cable ties, a couple of pieces of balsa and some hot glue. what about placement on a tricopter? having some issues with mine right now..
Can you move it out on the arm behind the camera? 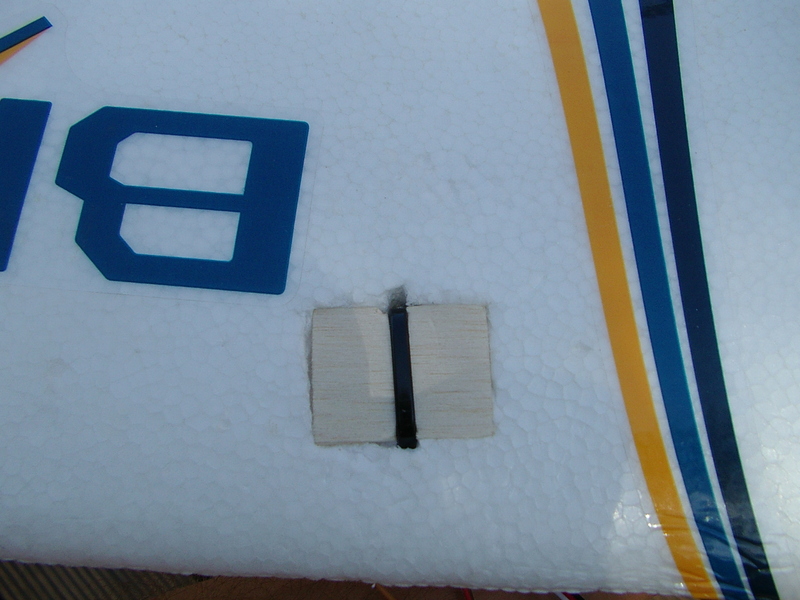 The main thing you need to make sure is that the body of the tri doesn't block the line of sight between the antennas. When you say the video was less than perfect what do you mean and at what range? I know I'm good for 3 klms with mine and if you use a directional antenna on the ground station, no reason why you can't go out to 25 klms. That's really strange because I'm using the 100wm FatShark 5.8Ghz system on my Mini Skywalker and the video is pretty solid within 1klm. I don't know what the range it because I've never gone beyond the 1K mark with the Mini Skywalker. Only time I have issues is when directly over my head, which is expected with the antennas that we use. I assume the antennas you're using are built for the Channel you are using? Haha, no, the antennas are nowhere near precision! It's very much from the RCModelreviews school. I used 1mm copper to make up for my lack of build skill and equipment to fine tune it. I initially made them for the relay between the 900Mhz system and the goggles, but I ended up getting a good deal on a 600mW 5.8 tx and tried them out. They work better than I thought they would but because they're so short the signal gets blocked by the plane very easily. short the signal gets blocked by the plane very easily. That's interesting because I've never had a signal blocked by the foam on the aircraft. Even on my bixler where 90% of the time that antenna is blocked I have no issues at all. I based my initial antenna position on your setup too! I'm extra keen on testing this out now... There is a distinct possibility that my antennas are, er, sub-optimal.